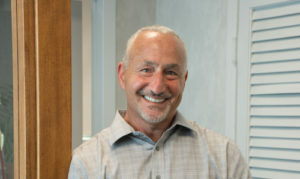 In the past the Hallmark Abstract Service blog has opined on the professionals whose job it is to forecast a variety of different outcomes whether economic or something else, and for better or worse the tendency for them to miss the mark that they have predicted! The article ‘Predicting The Weather, Mortgage Rates, Commodity Prices Or Most Anything Else Is Not For The Faint Of Heart!‘, points out that forecasting is a difficult endeavor at best (i.e. weather) and that in many cases the ‘experts’ are actually ‘talking their book’ concerning an outcome they want to see occur (i.e. Bitcoin going to $25,000 or higher). You get the idea. Sometimes incorrect predictions have little impact on those who rely on them as, for example, when we wake-up and it’s unexpectedly raining. In this circumstance so we simply bring an umbrella to work or change plans from a picnic to a movie. Other times, as in the Bitcoin example above, those who choose to rely on a given prognosticators prediction and take undo risks in the process (borrow money in order to invest) have the potential to experience serious financial pain (current price approximately $7,500 from a high of over $19,000). Or, conversely, experience exuberance when the prediction happens to come true. What If Government Predictions Are Wrong? When the government (state or federal) predicts a specific financial outcome and it misses the mark, the ramifications will unfortunately be felt by the people who always end-up footing the bill for every government misstep or miscue…The Taxpayer! We see this all of the time whether it’s the number of people who were expected to enroll in Obamacare or a program like Cash for Clunkers that was estimated to have cost the taxpayer $24,000 per vehicle. Now the federal government has embarked on a tax cutting program with the expectation (depending on who you listen to) that increased consumer and business spending will push GDP growth north of 3%, mitigating any loss in tax revenue. But, what if that expectation does not come to fruition and GDP growth is below 3% and as a result tax revenues miss the mark? Deficits will of course increase, an occurrence that will in some way need to be addressed. In the end, this will undoubtedly mean financial pain for the aforementioned taxpayer who will ultimately foot the bill. On the optimistic side, however, growth will hopefully explode to the upside and revenues to the federal government will exceed expectations! What Story Is The Citigroup Economic Surprise Index Telling? 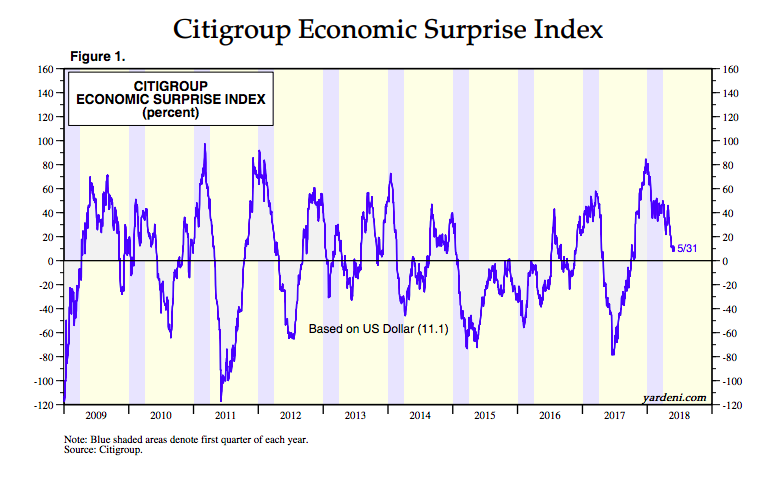 The Citigroup Economic Surprise Index below, developed by Dr. Edward Yardeni, tracks whether the economic forecasts have exceeded or lagged the actual data releases. A positive number indicates that actual data has exceeded forecasts while a negative number indicates that actual data has been below forecasts. While the number is still positive and well above the 2017 lows, the distance above -0- is declining indicating that the economy may not be as strong as had been expected given the tax cuts provided. The trend may certainly revert upward once again or continue declining to negative territory but, with the American taxpayer on the hook if tax revenues disappoint, it is definitely something to keep an eye on!